Leadoff hitter and winning pitcher Noah Austin gives Greyhounds spark. MONMOUTH — Batting at the top of Lisbon’s order, Noah Austin likes to get the offense going early, especially when he’s also tasked with keeping the opponent from scoring. Austin the leadoff hitter treated Austin the pitcher well, and vice versa, on Monday, reaching base four times and scoring two runs in support of his four-hit shutout in a 7-0 win over Monmouth. Austin and the Greyhounds took advantage of six Monmouth errors to score all their runs in the first two innings, which helped settle him into a rhythm early on the mound. He struck out seven, walked two and hit a batter. Austin led off the game against Mustangs starter Avery Pomerleau and reached on Monmouth’s first error, then scored on DJ Douglass’ double to left. Sean Scott (two hits) singled Douglass home. Four more Mustang errors in the inning made it 4-0 Greyhounds, who could have added more if not for having one baserunner caught stealing and another picked off. Austin’s one-out single got Lisbon going again in the second. Douglass followed with an infield hit and Lucas Francis drove them both in with a double to left. 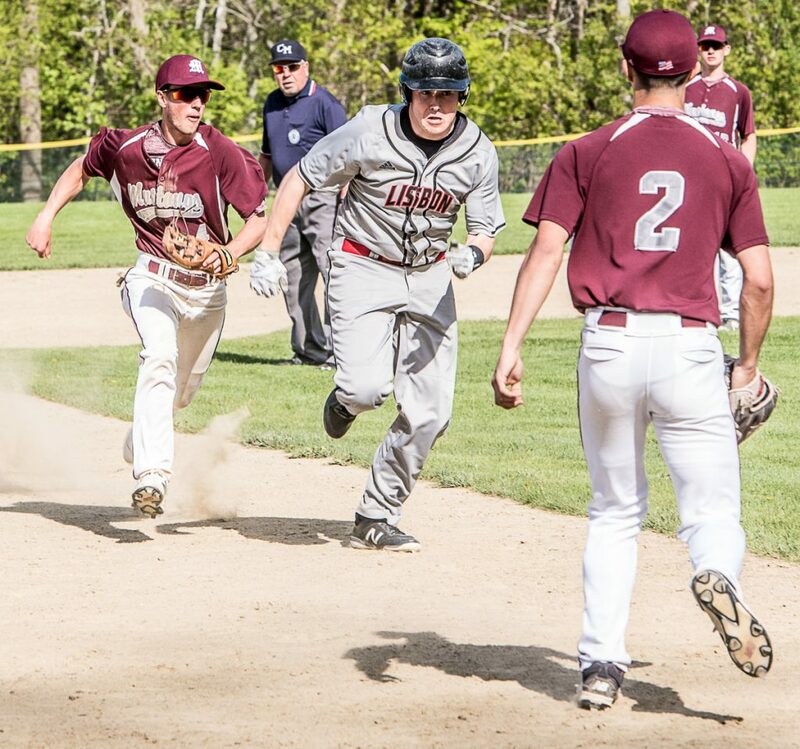 Monmouth’s sixth error plated Francis with the game’s final run. “I like to get a run that first inning, especially when I’m pitching but even when I’m not. It sets the tone early that you’re ready to play and everybody’s good to go,” said Austin, who had two singles, a walk and stole two bases. Corey Armstrong (five innings, two hits, five strikeouts, three walks) relieved Pomerleau and, thanks in part to better defensive support, shut the Greyhounds down. But Austin, mixing in his curveball effectively with his fastball, kept the Mustangs from posing a serious threat. In contrast to Monmouth, Lisbon’s defense helped Austin out when needed with no errors and one nice backhand play on a grounder to third base by Francis that got Austin out of his biggest jam, bases loaded with two out in the fourth. Monmouth put runners at the corners with one out in the in the fifth, but Austin got a strikeout and pop up to the catcher to nix that rally. He went on to retire the final eight Mustangs in order.